Lawrence of Berkley, L. Adams, and I hit the road Saturday morning for a little photo expedition to the Wood County Historical Museum. They had one of the bedrooms of the infirmary set-up as their general store exhibit and it provided a few interesting subjects. 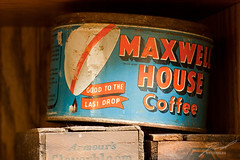 One yeilded what had obviously become the theme for the day -- a can for Maxwell House Coffee (the top item on the sign from The Corner Grill). The Christmas decorations blocked access to some of the other subjects though so I think we'll be making another trip once they reopen in the spring.